Whether you’re looking to scrap some metal or pick up some car parts and hidden treasures– a scrap yard can be a playground for your next pick. Scrap yards generally focus on salvageable goods such as metals, car parts, and even wood. If you’re working on a project or an automobile and don’t want to break the bank, a scrap yard should be your first stop. 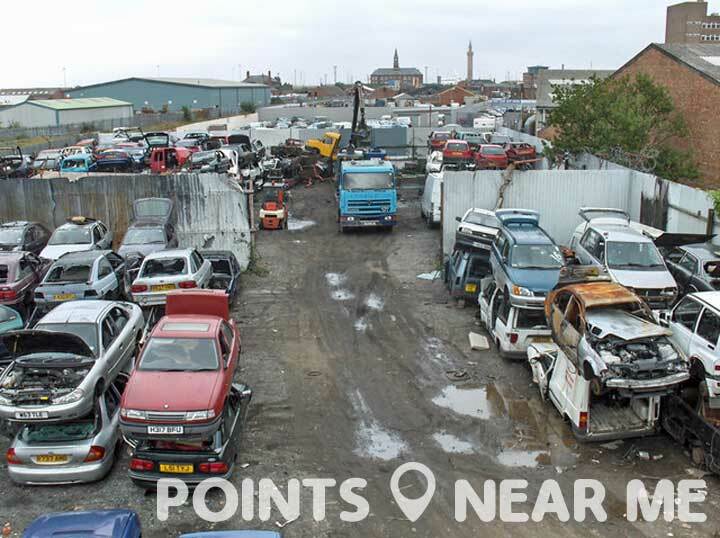 Ready to find a scrap yard in your local area? Simply browse scrap yards near me on the map below and find a list of scrap yards in your local area. Need more information on scrap yards? How about some insight on making money while scrapping? Read on for facts, trivia, and tips! Where can you find scrap metal? In recent years, scrapping metal for cash has become an easy way to score some quick dough. Whether you’re looking to make ends meet or just put away some pennies in your vacation fund, scrapping metal is a great way to get cash in hand fast. Where can you find scrap metal to sell at a scrap yard? Keep these ideas in mind as you search scrap yards near me. Part of scoring scrap metal is keeping your eyes open and knowing what has value. You can find scrap metal all over the place, even in areas that wouldn’t be an apparent source of metal. Often times, people just throw scrap metal or metal objects away because they aren’t aware of the value of metal. You can even go door to door and pass out fliers asking for scrap metal. Most people you meet will be happy to let you take their metal off of their hands. In some instances, you may even be able to go into buildings or demo sites to collect the metal. Of course, you’ll need to garner permission to do so. Never break into an old building to collect metal as you could be prosecuted for theft. Need some extra cash? Try a scrap yard! What’s the difference between a ferrous and nonferrous metal? While searching scrap yards near me, you’ll want to learn about the two basic types of metal– ferrous and nonferrous. What are the differences between these two types of metal and how can they affect your bottom line? Ferrous metals and alloys contain iron. Nonferrous metals do not. This is why experts always recommend carrying a magnet around when separating or searching for metal objects to sell. If your magnet actually sticks to a piece of metal, than you can almost guarantee that it is ferrous. IF the magnet doesn’t stick, it is likely nonferrous. Why does the type of metal matter at the scrap yard? Well, there is a huge price difference between the two types of metals. Nonferrous metals general pay more per pound than a ferrous metal will. If your magnet doesn’t stick, you might just leave with more cash in hand. Knowing what to look for and what may hold value is key when scrapping. Never waste your time by going without a magnet in hand. If there’s only one tool you bring to the scrap yard, let it be a great magnet. How much money can you make at the scrap yard? -Light iron and ferrous metals: $.06 to $.10 per pound. -Stainless steel: $.42 center per pound. -Aluminum: $.50 cents per pound. Now that you know how much money you can get from basic ferrous and non-ferrous metals, how much can you actually expect to walk away from as you search scrap yards near me? Currently, you can almost always expect to walk away with at least $200 should you scrap something such as copper or brass. The price that a scrap yard pays can change rather frequently, so don’t bet your rent on the fact that you’ll leave your scrapping adventure with more than a few hundred bucks. Sometimes, you’ll only earn $100 for the same thing you might have earned $200 on a month prior. Be wise and do your research. Know what to look for and what metals are currently in demand. Call around to local scrap yards and figure out what they’re paying before choosing a scrap yard to patronize. With a little foresight, you can get the most bang for your buck. Of course, making money isn’t the only thing you can do at the scrap yard. You can also dig for treasure!